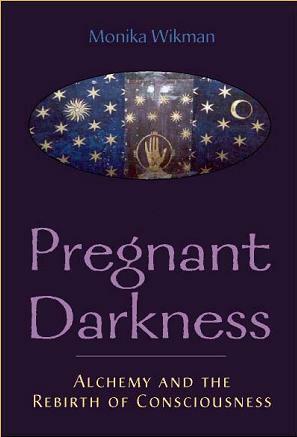 PREGNANT DARKNESS - Monika Wikman, Ph.D. Pregnant Darkness: Alchemy and the Rebirth of Consciousness uses alchemical imagery, emblems and myths to explore the depths of the human soul through the medium of dreams and visions. Alchemy is the art of transmutations. With the wisdom of the alchemical and Jungian traditions we can discover means to build bridges of experiential contact between human and divine realms. Numerous life stories, dreams and visions illustrate the mysteries of the divine dwelling and transforming in the human soul, as consciousness seeks rebirth in the depths during difficult life experiences. In Santa Fe it is available at Collected Works Bookstore and The Ark Bookstore. Monika Wikman stories us into transformation. In her case-studies of dream work with clients, both the drama of the personal psyche and our participation in collective myths shine as if through stained glass. The reader's own life takes on extraordinary colors of "what is possible." Monika Wikman is a gifted Jungian psychologist and astrologer. Pregnant Darkness is her first book. Breathtaking in scope and approach, the author explains how to cope with our dark hours by seeking a connection to the deeper currents of life. These are the currents of life which give form and meaning. Alchemical symbolism as applied to meditation visions, imagination, and dream work are discussed. A section titled "Mercurius as the Invaluable Inner Jackass" is sure to fascinate the reader in this intelligent discussion of the wilderness of the psyche. This book gives much food for thought. Dr. Wikman currently lives in Tesuque, New Mexico. This book with its wide approach to the psyche, and precise details, will find a large reading audience. Well worth your time to read, it is full of Jungian insights. This is a well-crafted nonfiction work, and a fine first book from Wikman. "Monika Wikman is a visionary seeker and therapist in the Jungian alchemical lineage who uses her extraodinary gifts of interior vision and dreaming to plumb the depths of the psyche and bring alchemical gold out of the crucible of suffering and illness. Pregnant Darkness is a marvelous journey through the mythic imaginal realms, to be savored for its delightful blend of fierce Artemesian insight and Mercurial playfulness." "Monika Wikman's book is an important contribution to the healing arts. Practicing astrologers, therapists, and spiritual seekers alike will benefit from her insights. New and Practical information about dream symbolism abounds. . . .Highly recommended for readers interested in inner alchemy or the connection between modern dreamers' unconscious imagery and healing Mother Earth." Archetypes of the Zodiac and Beyond the Mask. "Monika Wikman describes, with a rare knowledge of the terrain, the process of the growth and realization of the psyche. Above all it becomes abundantly clear that the aim can never be what we want for ourselves but what, through the most labyrinthine paths, the psyche wants for itself." "From Pregnant Darkness flows the bounty of the Great Feminine in her most galvanizing and healing forms made clear and applicable to modern life through the ancient mystery tradition of alchemy. Wikman has created a handbook for the celebration of everyday ecstasy and a map into the realms of timeless mystical experience. I dare you to pick this book up and open it to any page. You will discover direct personal guidance, stunning spiritual wisdom, and revelations designed solely to empower your particular cousciousness-raising journey." master storyteller, and co-author of Acting up!